7 Kids and Us: Kiddy Up Ball Cannon Blaster by Imperial Toys! When my boys were little, we had just about every toy that came with a ball. I don't know what the fascination is with little boys and balls, but they love them! They love to bounce them, throw them, pick them up, chase them, and roll them! 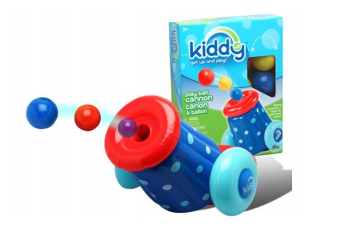 The Kiddy Up Ball Cannon Blaster is a super fun way for kids to play with balls. Place the balls in the cannon and SHOOT by stepping down hard on the launcher! This toy is perfect for ages 3 and up. Challenge your friends with the Pit Ball Cannon Blaster! Shoot Pit Balls up to 30ft with this fast-shooting blaster! Load the Pit Balls up and fire away, and enjoy countless hours of fun! You can purchase the Kiddy Up Ball Cannon Blaster at Target, Walmart and Amazon for about $19.99.